Sweet and slightly herbal, this infusion will tickle your tastebuds! For maximum flavor, there are two things you need to do: 1) rip the thyme leaves before infusing and strain them before serving and 2) infuse for 24 hours. Even though pineapple is a juicy fruit, its juices do not release as readily as other fruits, which is why you need to infuse for longer. 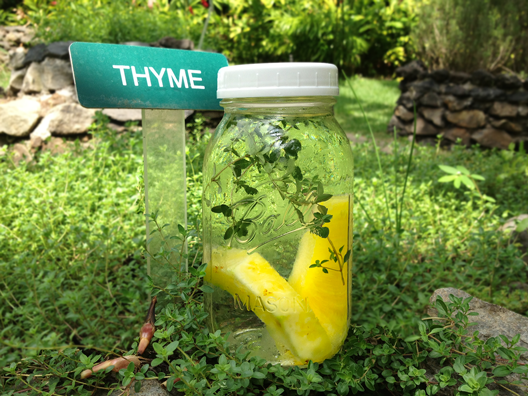 Recipe for a 32-ounce Ball jar: two 1” thick slices of pineapple + 5 sprigs fresh thyme, torn. Infuse in the fridge for 24 hours and strain before serving. 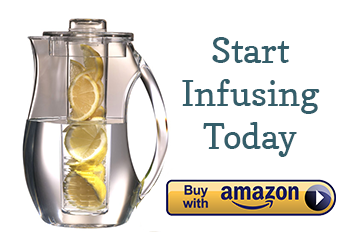 If you are making your fruit infused water in a Ball jar, this straining top really makes your life easier. Enjoy!